She did exactly that in 2005, winning her first national title at 1500m. It was sweet justice after the 2004 Trials semifinal, when she was heartbroken after falling a few meters from the end and failing to advance despite a dramatic crawl across the finish line. Since then, Treniere has used the mishap as motivation, slashing 9 seconds off her personal best and twice defending her national title. “It took me a long time to get over it,” she said in a recent interview. “I saw the line there and it was heartbreaking. In 2005, the motivation was out of the roof. After that, I knew I had a lot more in me than what I had been running." After a string of national titles and top domestic rankings, Treniere struggled to regain her national championship-level form, and failed to qualify for an international championships for several seasons, until a change of training environment turned her fortunes around. In 2013, Treniere moved to Portland to train with Alberto Salazar's group and by the summer of 2013, Treniere had improved on her seven year-old personal best and had captured her first national outdoor title since 2007. 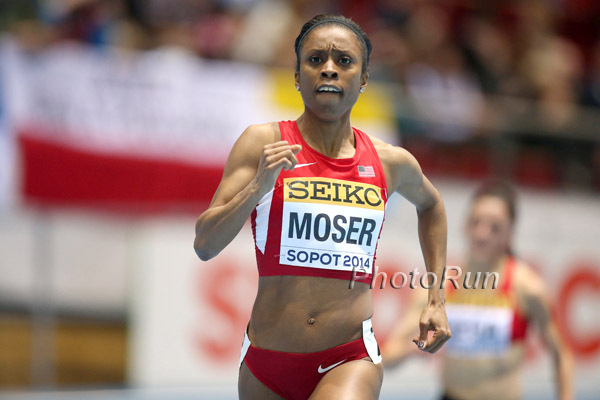 Though an injury forced her to withdraw from the World Championships that year, Treniere found herself back on top early in 2014, winning the US Indoor Champoionships over 1500m in March.